Dubai, UAE, May 14, 2018: Al-Futtaim Toyota, leader in sustainable mobility since 2008, welcomes Rush, a new versatile 7-seater SUV into the Toyota line-up , designed for those looking for the functionality and space of a large SUV as well upgraded lifestyle and affordability of a small SUV. Carving itself a niche in the growing small SUV segment, Rush enjoys a unique offering, as it combines the space and solid road performance of a large SUV, with top level-leading fuel economy performance, and Toyota-guaranteed dependability, all packaged in a stylishly designed body. “Crossover utility vehicles and compact SUVs represent the fastest growing segment in the global automotive industry. In our region, this category of vehicles has been on a steady growth trend since 2013 and is expected to steer in the same direction in the coming years, accounting for 25% of the total SUV market in the UAE. This growth is mainly driven by customers who want more lifestyle-oriented vehicles, affording them all the benefits of an SUV such as styling and higher seating position, at a similar price of a passenger car” said Saud Abbasi, Managing Director of Al-Futtaim Toyota at the car launch event. Toyota Rush features a dynamic, high-end design appropriate to an SUV, presented in a bold shape with sophisticated three-dimensional lines on the sides of the body. The chrome finish on the grille and headlamps enhances the wide, sharp and advanced image of the frontal fascia, giving the car a premium look. Despite its compact body, the interior of the Rush features high-quality accessories worthy of a class above vehicle for greater SUV enjoyment. With its roomy three-row seating design, Rush is able to accommodate 7 adult passengers even when all seats are in use. The double-folding feature on 2nd and 3rd row seats provides easy access for all passengers and ample cargo space when needed. The designers aimed to create a powerful all-terrain-capable SUV that provides powerful traction on all types of surfaces. With a front-engine, rear-wheel-drive layout, and a class-top ground clearance, Rush conquers every terrain while offering ride comfort and quietness and excellent handling stability. The highly rigid body, ample suspension stroke and rear stabilizers ensure the stable steering and ride comfort needed to prevent fatigue on long trips. Rush is available in a 1.5L in-line 4-cylinder petrol engine with Dual Variable Valve Timing-intelligent (VVT-i), which, along with an optimized combustion chamber and lightweight moving parts, provides enough power and excellent fuel efficiency. Rush has been given an ample array of safety features to ensure driver and passenger peace of mind. The 5-star ASEAN NCAP-rated collision safety features include a sturdy body structure, SRS driver and front passenger air bags, SRS side air bags and SRS curtain shield air bags. Vehicle Stability Control (VSC) and Hill-start Assist Control (HAC) systems are provided as standard features to help provide safety during routine driving. Rush is an authentic SUV that Toyota has confidently released in over 100 countries. 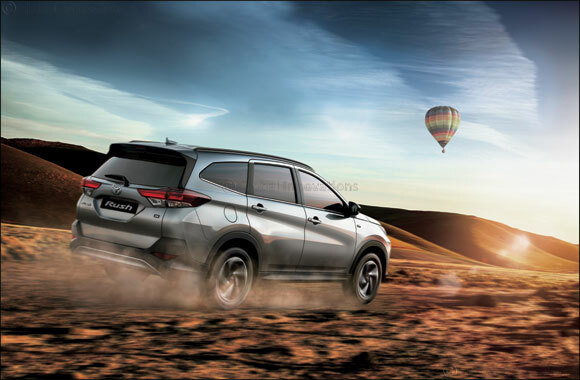 In the UAE, the new SUV will be available with 17 inch alloy wheels and 5 exterior color choices, all presented in an unbeatable package of only AED 68,500.